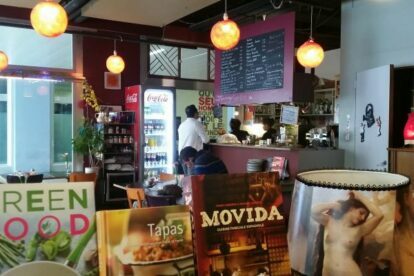 The name of this cafe and bookshop speaks for itself: Les Recyclables is all about sustainability and conviviality! Everyone can bring its books to the shop, but only the best preserved or latest ones are put up for sale. With this conception of second-hand books the bookshop offers a large selection of nice and good books: from classics, to detective stories, from philosophy to cooking books. It also has English, German, Spanish departments. The booksellers are really invested and always place books suggestions about actuality and topics on tables. A range of these tables separates the bookshop and the cafe. This second space changes over the day. In the morning it is a nice place to drink a cup of fair-trade coffee with a newspaper. The restaurant proposes meals with local products for lunch and dinner. But I prefer to go in the afternoon for a tea or and apple juice; the bay window offers the opportunity to observe people in the street. In the evening concerts of world music and plays are on the agenda several evenings a week.